FAYETTEVILLE, Ark. 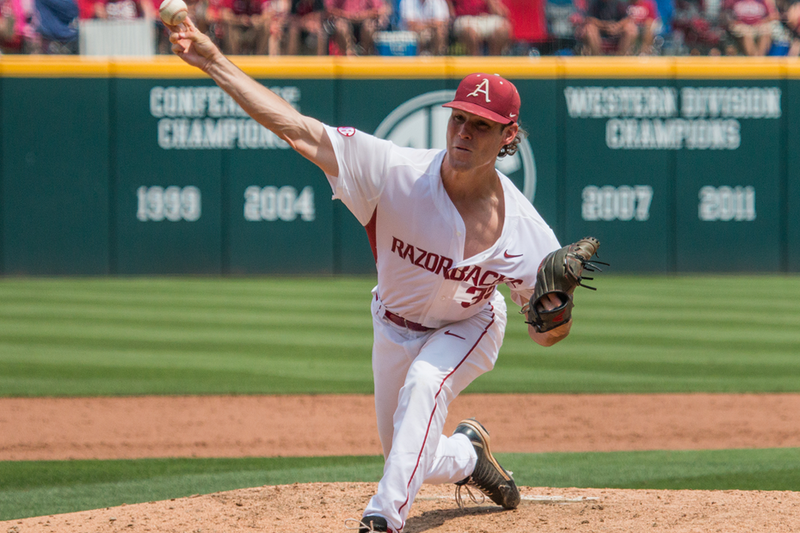 – The Arkansas Razorbacks (39-23) fell 3-1 to Missouri State (49-11) in Game 2 of the NCAA Fayetteville Super Regional. With the series tied at one, a decisive Game 3 will be played tomorrow at 2 p.m. with a trip to the College World Series on the line. Arkansas received an outstanding relief performance from senior Jackson Lowery, who pitched 6 2/3 innings and allowed just three hits and two runs. Joe Serrano led off the seventh with a walk and advanced to second two batters later when Golden Spikes Award finalist and SEC Player of the Year Andrew Benintendi also drew a base on balls. Serrano scored on a sharply hit ball that was misplayed by the shortstop, giving the record crowd some energy. After setting the Baum Stadium attendance record yesterday, Razorback fans did not disappoint on Saturday. The attendance mark was broken for the second time in as many days with 12,167 fans on hand. Student tickets for Game 3 will go on sale at 9 a.m. Sunday at the Bud Walton Arena box office near the south entrance. Due to parking lot closures and to avoid confusion and congestion surrounding Baum Stadium on Sunday, student ticket purchases will take place at Bud Walton Arena. An allotment of 250 general admission tickets in the Hog Pen will be available to students for $15. Students are limited to one ticket per person and must be present to purchase and show a valid and current UA student ID. For more information on student tickets for Game 3, please visit www.ArkansasRazorbacks.com.